110 Baby Sea Turtles Released! Olive Ridley Sea Turtles will become extinct without the help of humans to increase their numbers once again. Due to beach pollution, tourism and building along the coast, it has become almost impossible for the natural process of nesting, hatching, and migration to take place. 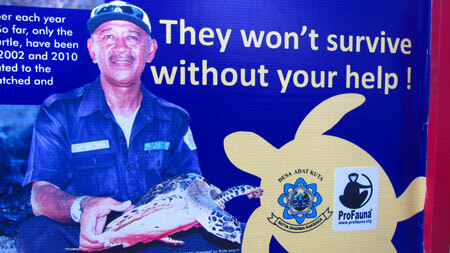 The famous Father Turtle is pictured on signage around the beach. 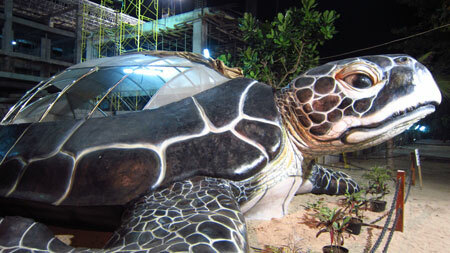 We were ecstatic to help the famous “Father Turtle” on Bali’s Kuta Beach with his conservation project. This is his drill: Every few nights, when Father Turtle spots a nesting turtle, a call goes out to volunteers. Everyone jumps out of bed and meets on the beach. This nesting stage of a turtle’s life is called the arribada, a Spanish term meaning arrival, and the Olive Ridley is one of only 2 species of marine turtles that exhibit this behavior. The arribada takes place in the dark and 80-130 eggs are then carefully gathered. Olive Ridley sea turtles reproduce every 1-3 years, so this one night is important. If this collection does not occur, the eggs will be crushed by the hundreds, and sometimes thousands, of tourists who will visit Kuta Beach the following day. 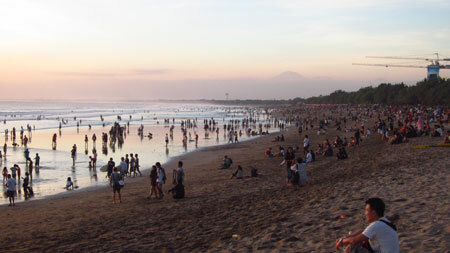 Busy Kuta Beach is not an ideal place for turtle eggs to hatch. Even if the eggs did have a chance to hatch in their natural beach habitat, the bright lights from resorts and restaurants nearby simulate the moon and confuse the tiny turtles, leading them inland instead of to the water. 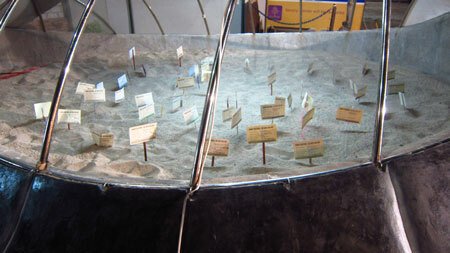 When the eggs are collected and recorded, they are labeled and placed in a giant sand box, shaped like a sea turtle! This structure keeps turtle eggs safe. This is where they are kept safe from animals and people for the next few weeks. When they finally hatch, the babies are only one inch long and wriggle their way up to the sandy surface. Volunteers place them in large bins before releasing them carefully into the waves. Eggs are recorded and tagged before being reburied in the sand. See this movie, taken on the day of the turtle release! Conrad & Aidan, this one is dedicated to you! Click here or look below to see the video made by Jason. Many thanks to the overwhelming number of friends & family who specifically gave to the sea turtle conservation, namely The Brill Family, Stacy Hendrickson, Erin Fox, Andy Hartman, The Strader’s, The Golna’s, The Vessell’s, The O’Byrne’s and The Piazza’s. Because of the many donations to this cause, we will be searching for a second sea turtle project during our travels! What can we do to ensure the sea turtles do not become extinct? Dispose of trash and fishing line properly, especially at the sea shore. Turtles mistake plastic for jelly fish and the trash ends up suffocating them. Clean up the trash you do see on the beach. Refuse to buy sea turtle products, such as tortoise shell jewelry, meat and eggs. Support conservation agencies and assist in turtle research and conservation. If you would like to volunteer to save the Olive Ridley turtles on Bali, contact the ProFauna office in Bali at wayan@profauna.org. Who won the race?????? Cool stuff. Keep iy going guys. LOVE going on my e-mails and seeing there is another post. Looking forward to many-many more. 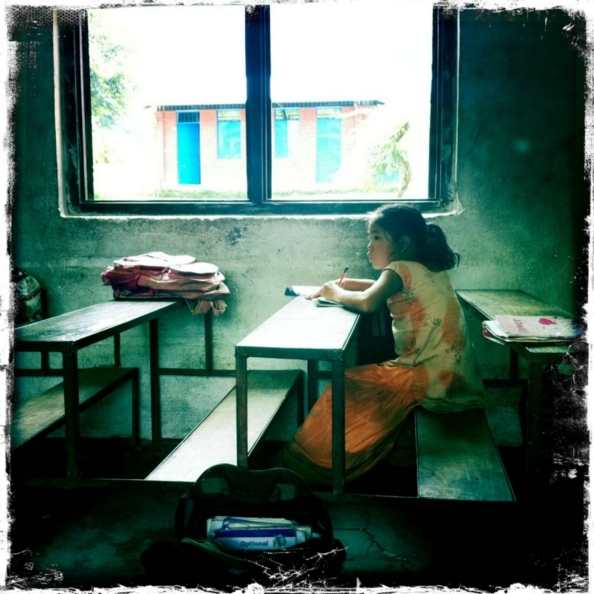 Awesome post and video, Erin and Jason! What a great experience to be able to help the sea turtles in such a way! They are beautiful creatures. And pretty darn cute! Awesome, guys! So glad you were a part of this! The videos are all pixelly and I can’t watch them, but your photos and detailed writing allow me to picture it like I was there!